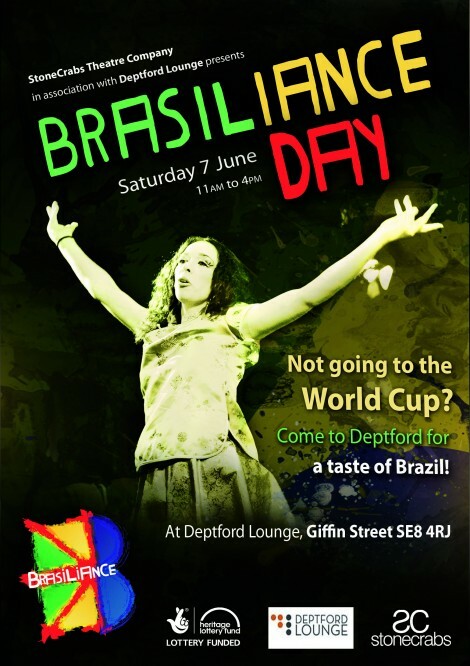 A taste of Brazil in Deptford from 2 – 7 June 2014! Brasiliance exhibited the materials collated during a year’s research and Oral History investigation around Brazilians who settle in the UK since the 60s. The exhibition shared photographs of interviewees, extracts of their stories, workshops and learning sessions organised to promote the Book and DVD Brasiliance, London Pathways, heritage, identity and imagination. The exhibition closed on the 7th of June with an array of activities organised and delivered by volunteers from the local community, students from Regent’s University, professional musicians and many others. Together, we created an unforgetable day of celebrating the Brazilian Heritage in London. The day included: Brazilian storytelling for little ones, join in a discovery of the weird and wonderful world of Brazilian folktales; Capoeira roda, led by Master Silvia Bazzarelli (on Giffin Square); Brazilian Live music, guitar & percussions by Menino Josue and flashmob performaces of ‘Something Blue, Something Yellow and Something Green’ directed by Franko Figueiredo and choreographed by LoRIOca. What is Life for you?